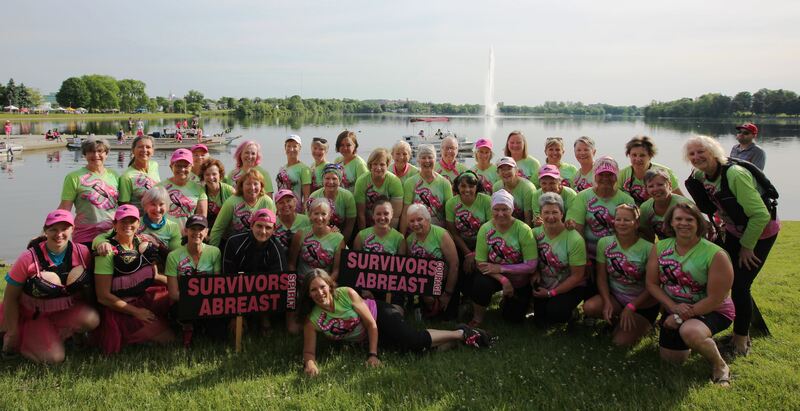 Survivors Abreast is a group of breast cancer survivors from the Peterborough area in various stages of treatment and recovery. We have something else in common—strength of spirit. We are committed to living our lives to the fullest and sharing that expectation and hope with others. When you see us on the water, we’ll be a crew of twenty paddlers wearing hot pink lifejackets. Age is not important; our members currently range in age from 30 something to 70 something and come from all walks of life. Survivors Abreast Dragon Boat Team annually hosts Peterborough’s Dragon Boat Festival and in 2010 we were hosts of the International Breast Cancer Dragon Boat Festival held here in Peterborough ! You will have experienced a diagnosis of breast cancer plus share our interest and enthusiasm for the sport of dragon boating. From May through September, we paddle twice a week on Little Lake. To keep fit and continue our paddle practices throughout the winter months, we utilize the state-of-the-art Carol Love Rowing/Paddling pool at Trent University. We work on paddling skills, strength, endurance and timing. Our training prepares us to race in three or four out of town festivals throughout the summer. We host Peterborough’s Dragon Boat Festival each June, which raises funds for the benefit of breast cancer diagnosis and treatment in our community. We hold 6 to 8 team meetings per year, as well as occasional social get-togethers. Many of us participate as a group in other community events such as the Run for the Cure and the Relay for Life. For more information about how the team works, please visit our Governing Documents page.